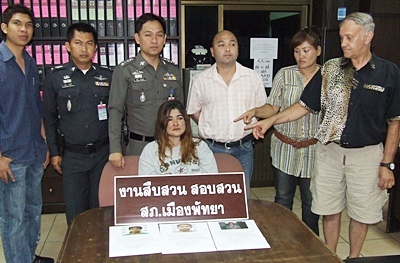 The victims point to pickpocket gang leader Sunan Lamsaard. The head of a family-based gang of suspected thieves previously arrested for stealing from tourists has been arrested again for allegedly pick-pocketing a Belgian man’s wallet containing 90,000 baht in cash and airline tickets. Sunan Lamsaard was taken into custody Oct. 6 after being picked out of book of mug shots by Robert Eeckhoudt, 62, and his 39-year-old wife Naiyana Piromna. Suspected of leading a gang of family members in pick-pocketing tourists in baht buses on Thepprasit Road, the 40-year-old Sunan was arrested, but set free, for a similar crime in 2001. The couple positively identified Sunan, but the woman denied she had anything to do with the Oct. 4 theft of their property from a baht bus near the Dolphin Roundabout. If you get on a baht bus and see either of these two women, either get right out again or make sure to protect your valuables. Naiyana said she and her husband had just arrived from Belgium to visit friends in Pattaya and were taking a taxi from Naklua Road to Royal Garden Plaza when two women boarded the bus and began chatting with her husband. Only when they exited the baht bus did Eeckhoudt realize his wallet – containing 2,000 euros, their return air tickets, passports and credit cards – was missing. The Thai wife immediately suspected the over-friendly women and they immediately filed a police report. The couple had to contact Eeckhoudt’s daughter in Europe for money to return home, which they planned to do right away, becoming two more tourists quickly turned off to Pattaya by the police’s inability to keep known thieves off the streets. Ton Krabok flood-control project set for completion in Jan.